If you're looking to buy a luxury vehicle, then you know you're going to have to pay quite a bit upfront or monthly. However, car insurance for a high-performance car can cost as much as the vehicle itself. Factors like driver demographics, driving record, credit score, or even state laws, can cause your monthly premium to skyrocket. While the monthly payments might be affordable, car insurance policies for new cars (even with additional safety features) can cost hundreds — or even thousands — of dollars per year. As the nation’s leading car insurance search engine, The Zebra has access to millions of rates from across the United States. Using our quote engine, we found the top 10 most expensive cars to insure (more on our methodology). From 2017 to 2018, the average insurance cost for an Audi R8 increased by almost 150%. As a high-performance vehicle, the manufacturer-suggested retail price (MSRP) is $138,700. If you’re looking to get the cheapest insurance rate for an Audi R8, start with Nationwide, offering an average annual premium of only $965. 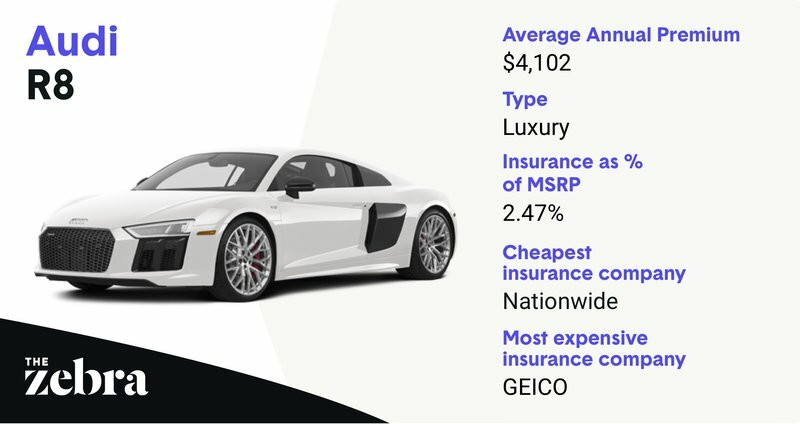 Our data shows the most expensive company for Audi R8 insurance is GEICO, with average annual costs of $2,391. 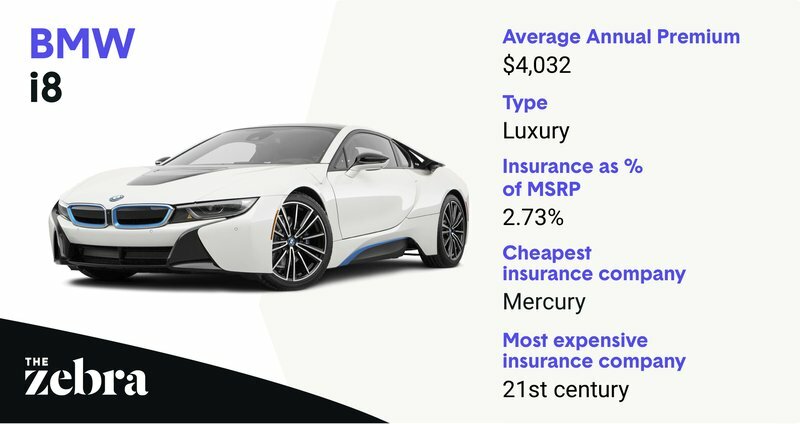 Data from our 2018 State of Auto Insurance shows that costliest company for insuring a BMW i8 is 21st Century, with an average annual premium of $4,265. Because it’s a luxury vehicle, the car insurance coverage cost will be 2.73% of the MSRP. Year-over-year, the average annual premium for a BMW i8 increased from $2,522 to $4,032, making this model one of the more expensive vehicles to insure. Shopping for car insurance for Dodge Viper can be a difficult process, primarily because it’s one of the most expensive cars to insure. As a luxury car, the annual car insurance premium is about 4.21% of this vehicle’s MSRP. In the past year, the average annual premium for a Dodge Viper went up from significantly, to $3,921. 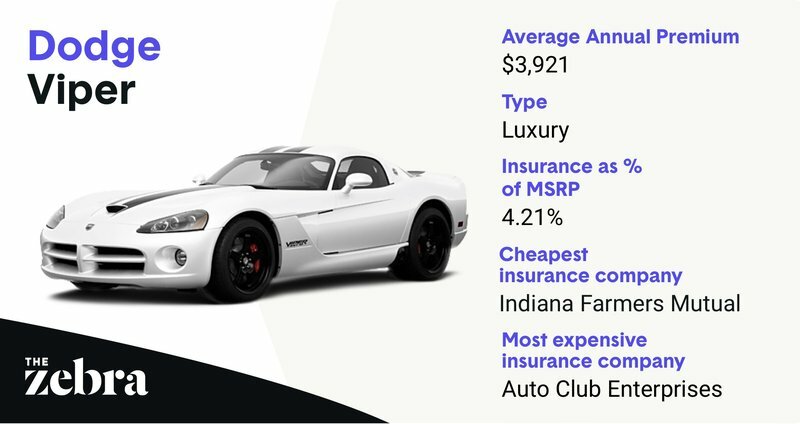 So if you’re looking to save as much money as possible, consider shopping with Indiana Farmers Mutual, which covers the Viper for the cheapest rates. Try to avoid Auto Club Enterprises, the most expensive insurance company for the Dodge Viper. From 2017 to 2018, the average annual premium for a Nissan GT-R increased by almost 42%. The GT-R's MSRP is $99,990. 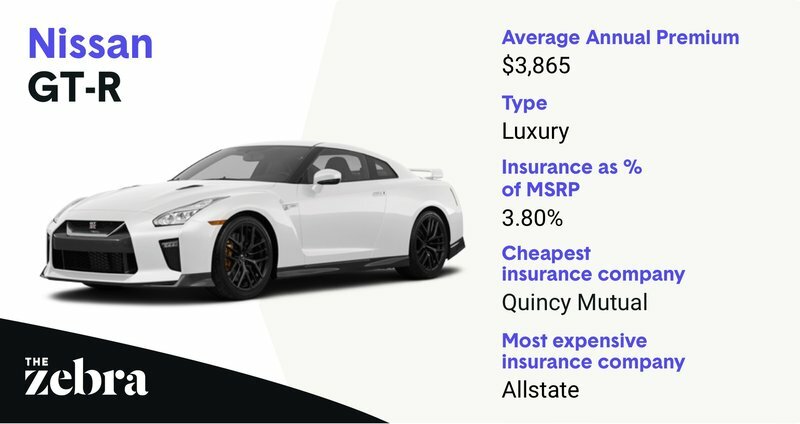 If you’re looking to get the most affordable insurance rates for a Nissan GT-R, start with Quincy Mutual, with average annual premiums of $1,163. The most expensive company for Nissan GT-R insurance is Allstate, with an average cost of $6,344. Compare insurance rates for your luxury vehicle today! 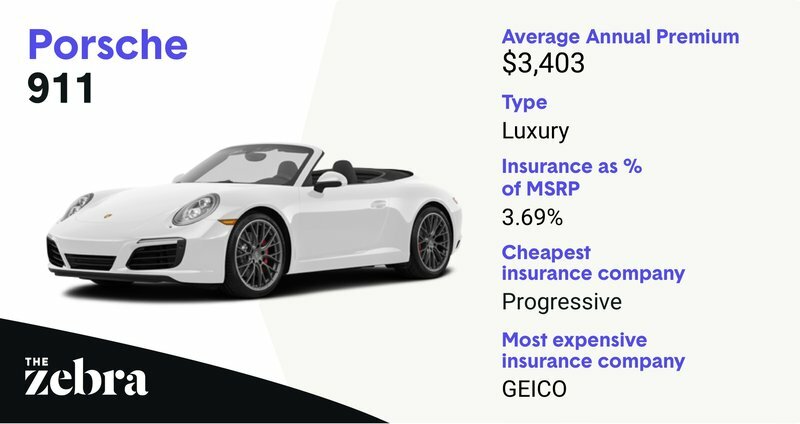 Our State of Auto Insurance report shows the costliest company Porsche 911 insurance is GEICO, offering average annual rates of $2,142 per year. The cost of insurance on a Porsche 911 is 3.69% of the MSRP. Year-over-year, the average annual premium for a Porsche 911 increased from $1,469 to $3,403, making this model one of the most expensive vehicles to insure. Shopping for cheap car insurance for BMW X6 can be a long process, primarily because it’s one of the most expensive cars to insure. The annual insurance premium on an X6 is about 5.31% of the MSRP. In the past year, the average annual premium for a BMW X6 increased by about 42%, from $2,389 to $3,395. So if you’re looking to save as much money as possible, consider shopping with Progressive, which offers relatively cheap insurance for the BMW X6. Try to avoid 21st Century, which offers expensive X6 auto insurance. From 2017 to 2018, the average annual premium for a Tesla Model S increased by almost 330%. If you’re looking to get the cheapest rate on your Tesla Model S, we suggest shopping with Progressive. 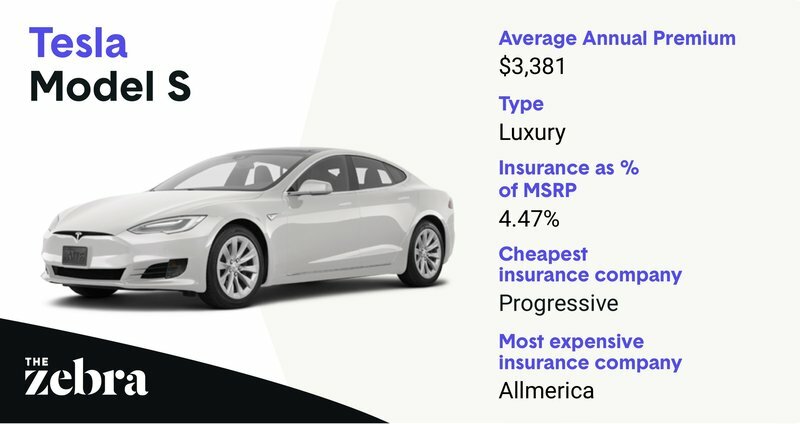 Our data shows the most expensive company through which to insure a Tesla Model S with is Allmerica. 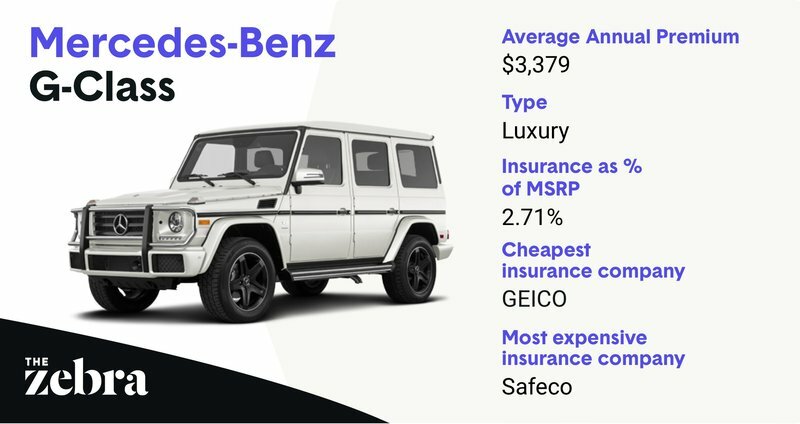 Data from our 2018 State of Auto Insurance shows that costliest company to insure your Mercedes-Benz G-Class with is Safeco, where your annual premium might be $4,551. For the G-Class, the average insurance coverage cost is 2.71% of the MSRP. Year-over-year, the average annual premium for a Mercedes-Benz G-Class increased from $1,319 to $3,379, making this model one of the more expensive vehicles to insure. 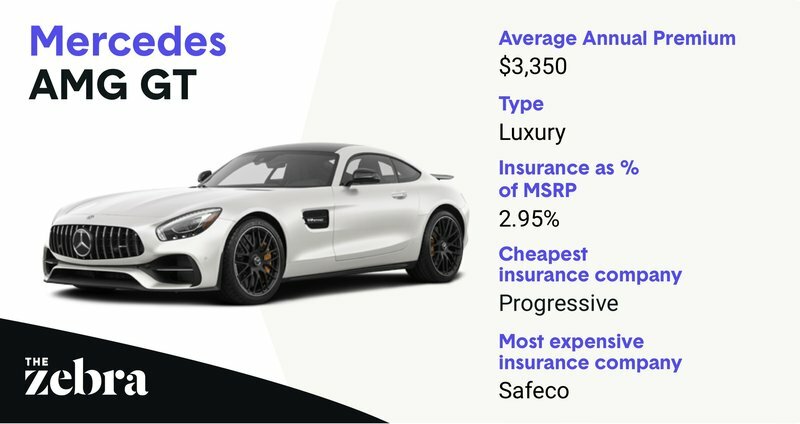 Shopping for car insurance for a Mercedes-AMG GT can be a difficult process, primarily because it’s one of the most expensive cars to insure. As a high-performance car, the annual car insurance premium is about 2.95% of this vehicle’s MSRP. In the past year, the average annual premium for a Mercedes-AMG GT went up about 69%, from $1,985 to $3,350. So if you’re looking to save as much money as possible, consider Progressive, which insures the Mercedes-AMG GT at the lowest cost. Try to avoid Safeco, which provides the most expensive coverage. From 2017 to 2018, the average annual premium for the BMW 7-Series increased by almost 193%. If you’re looking to get the cheapest rate on your BMW 7-Series, we suggest shopping with USAA, where the average annual premium is only $619 per year. 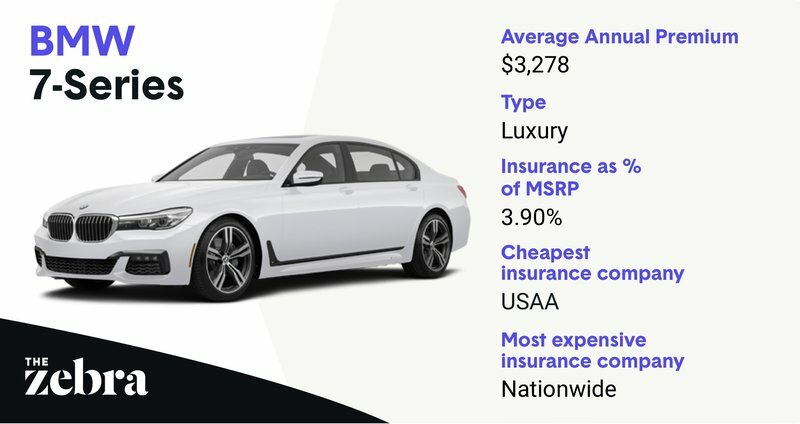 Our data shows that most expensive company through which to insure your BMW 7-Series is Nationwide, with annual premiums of $1,401 a year. 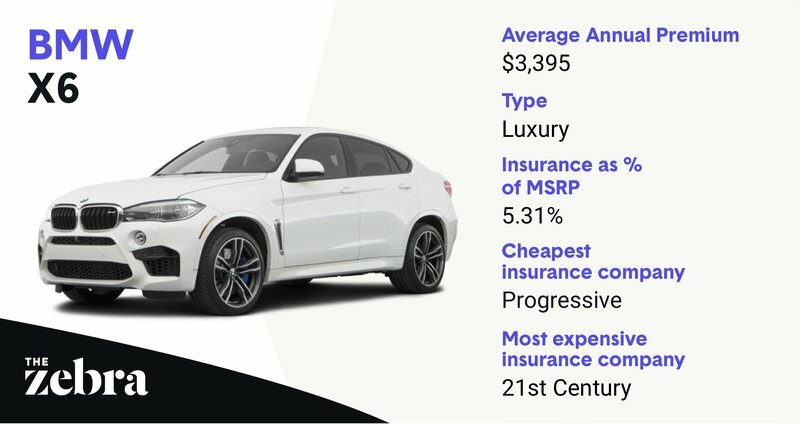 Between September and December 2018, The Zebra conducted comprehensive car insurance pricing analysis using its proprietary quote engine. This comprised data from insurance rating platforms and public rate filings. The analysis used a single insured driver profile: a 30-year-old single male with a clean driving record and coverage limits of $50,000 bodily injury liability per person/$100,000 bodily injury liability per accident/$50,000 property damage liability per accident, with a $500 deductible for comprehensive and collision, driving a 2013 Honda Accord EX.